Monkeys, darts, tower defense, and co-op, together at last! Here's something you don't see every day: a browser game with online co-op support! Ninja Kiwi has taken the ever-popular Bloons TD 5 and included a two player online co-op mode, complete with loot sharing and four new levels. 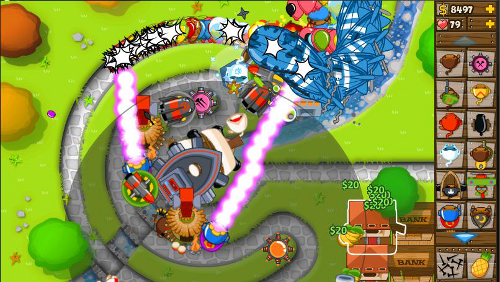 At its core, Bloons TD 5 is a casual tower defense game, only instead of towers shooting arrows and creeps running around, it's all about invading balloons and monkeys throwing darts. Co-op play is, unfortunately, exclusive to the version of Bloons TD 5 hosted on developer Ninja Kiwi's website. You also have to play through the first ten levels of the game before unlocking co-op, which is sort of a letdown. But hey, monkeys and balloons, right? Page created in 1.8767 seconds.